Marijuana can be addictive. Many factors play key in whether you will become addicted, such as age, genes, personal relationships, length of use, etc. Marijuana is the second drug linked to most car accidents. While alcohol still holds the number one spot, driving under the influence of marijuana will slow your alertness, concentration, coordinator, and reaction time. Marijuana is linked to educational failure. Causing negative short and long term effects on your attention and memory, marijuana use has been linked to lower grades and drop outs. Marijuana use can result in psychosis or panic attacks while under the influence of the drug. While these reactions wear off as a user comes down off their high, there is limited studies to show if marijuana use will leave a long term effect or cause mental illness over time. 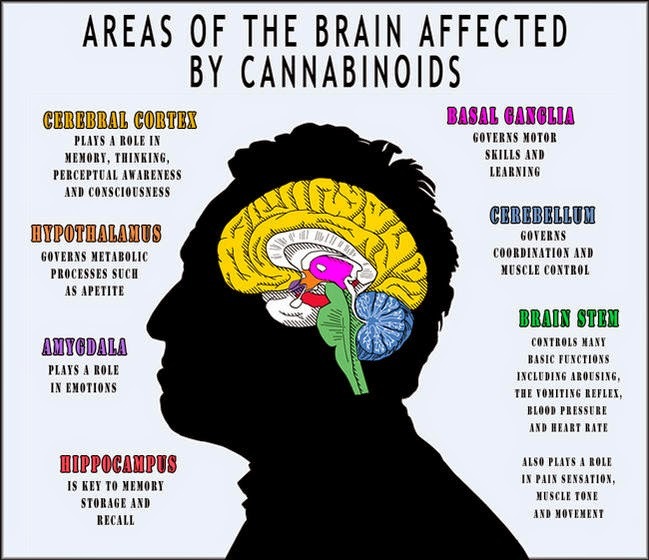 Tetrahydrocannabinol, or THC, is the chemical responsible for most of marijuana's psychological effects. THC attaches to brain receptors associated with memory, pleasure, movement, thinking, concentration, coordinator, and sensory/time perception. Marijuana is a psychoactive drug, meaning is causes mind altering effects. Marijuana affects your lungs, just like tobacco use. Use can result in lung problems such as a daily cough, bronchitis, or pneumonia. Marijuana does cause withdrawal effects in those who quit using. A marijuana user will experience the same withdrawal effects as someone who is trying to quit tobacco use, which can make it hard for someone to stop using marijuana. THC has been found in breast milk. Women who are breast feeding their child, should avoid use to prevent infant exposure and possible development effects. Smoking marijuana while pregnant can cause damage to the developing baby, such as learning disabilities.